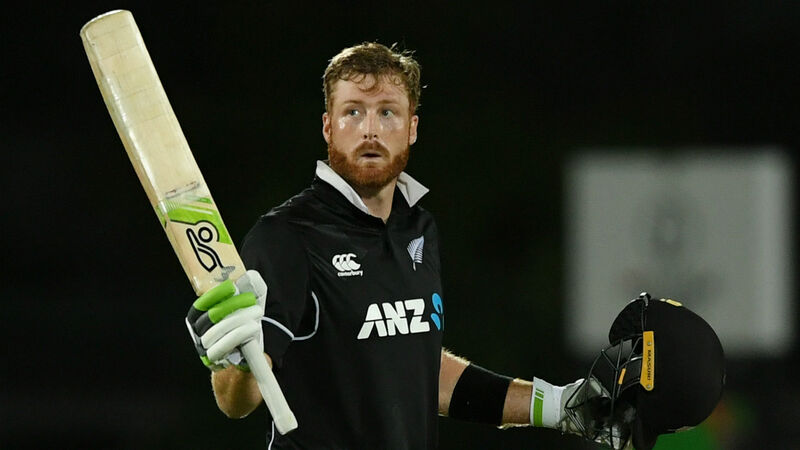 Martin Guptill's unbeaten century led New Zealand to a comfortable eight-wicket victory over Bangladesh in the first match of the one-day international series. The hosts dominated in Napier as Bangladesh failed to bat for the full 50 overs and were bowled out for 232, which represented a recovery after they had slumped to 42-4. With Trent Boult (3-40) and Mitchell Santner (3-45) having done the damage with the ball, Guptill took the lead with the bat as he finished 117 not out off 116 deliveries to account for more than half of his team's total. Bangladesh will look to level the three-match series when the two meet again in Christchurch on Friday. Martin Guptill cruises past triple figures, his 15th ODI century off 103 balls. It was evident the tourists were set for a struggle when Tamim Iqbal (5) fell to a deceptive Boult outswinger in the second over. That set the tone for the opening overs as Liton Das (1) and Mushfiqur Rahim (5) went cheaply, while Soumya Sarkar's promising start was halted when Matt Henry had him caught and bowled for 30. The most significant contribution came from Mohammad Mithun, whose 62 helped Bangladesh reach a moderately competitive total that was also boosted by Mohammad Saifuddin's 41. However, it was a target the Black Caps had no trouble in chasing down and they had three figures on the board before Mehidy Hasan bowled Henry Nicholls (53) for Bangladesh's first breakthrough. It did little to stifle New Zealand's progress and captain Kane Williamson (11) was the only other wicket to fall, with Guptill and Ross Taylor (45 not out) the men to see the Black Caps home. Guptill – who chalked up his 15th ODI century – hit a huge six down the ground to level the scores and the single that followed confirmed victory with 33 balls to spare.